3 DIY Honey Hair Care Recipes You Must Try! Here are some of the most common and effective DIY honey hair care recipes to add shine to lackluster locks and fix troubling split ends. And they require only very few ingredients to prepare. Success! This honey and apple cider vinegar mixture is effective for reviving natural acid balance in the hair and repairing dry and damaged hair. Apply as a conditoner 2 tablespoons of apple cider vinegar and 2 tablespoons of honey and massage onto hair and scalp. Wash and rinse off after 5 to 10 minutes. For lustrous, silky, healthy hair and scalp, simply combine 1/2 cup honey and 1/4 cup olive oil. Massage this conditioner into hair, then put on a shower cap for 30 minutes. Shampoo and rinse as usual. A great all-natural hair conditioner for revitalising lifeless, limp and dull-looking hair! Troubled by stiff and brittle hair? Mix 2 tablespoons of honey and 1 to 2 egg yolks. Apply and massage the mixture into wet hair. Leave it on for 30 minutes, then wash and shampoo as usual. This treatment will restore your hair and leave it hair soft and manageable. It is also a wonderful hair mask for fixing greasy hair. FAQ: Does Honey Make Hair White? Now this sounds incredibly scary, but it appears to be a concern of many people who are keen to try honey as a natural, chemical-free, moisturising shampoo. Some sources seem to be suggesting that honey should not be used on the hair as it has whitening effects. I have very dark black hair and honey does not have any negative effect on the color despite the fact it has been used many times on my hair as a conditioning shampoo. In fact, honey has made my hair look even glossier and darker. Yes, raw honey naturally releases hydrogen peroxide upon diluting with water, but the amount is too minute to turn black hair into white. It is safe to be used on the hair. For those with light color hair, for instance light brown, honey when used regularly as hair mask over time or when it is applied to the hair for 8 to 10 hours without rinsing off may give the hair a slightly lighter color tone. But in order to turn brown hair into white, you would need a much larger amount of hydrogen peroxide than what a small amount of honey is able to produce. 1. Facing a hair-falling problem? See if honey can help. More in: Hair Loss Remedy With Honey. 2. 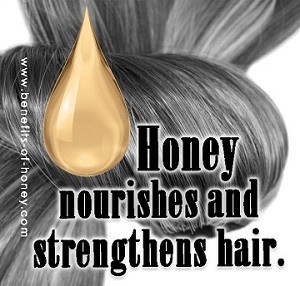 Honey and coconut oil can make a significant difference in keeping your hair in superb health. Read: Honey and Coconut Oil Benefits for Hair and Skin. 3. Honey can help make your mane look gorgeous: Discover 4 wonders of honey for your hair and scalp. End of "3 DIY Honey Hair Care Recipes You Must Try!". Go to "Natural Skin Care"